The sainted Pius X, son of a postman and a seamstress, radiated a holiness which deeply impressed those who came into contact with him. The ordinary Italian people hailed him as a saint - a verdict that was confirmed by the Church forty years after his death. His body, bearing a silver face mask, can be seen under the altar in the Presentation Chapel. The Monument to St. Pius X (1904-1914) was planned by the architect Florestano Di Fausto and carved by the sculptor Pietro Astorri in 1923. 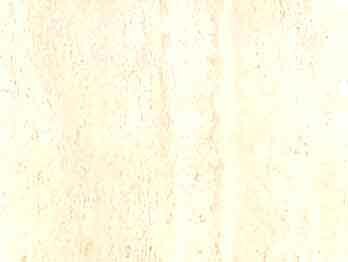 The Pontiff, carved from the whitest marble, is shown standing, his arms outstretched to the faithful. Around the door and on its panels are the most beautiful bas-reliefs in bronze illuminated with gold, recalling episodes from the saint's life. Above the facing door is the Monument to Pius X, squeezed into a rather small niche. 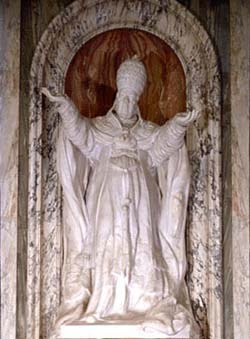 The Pope is shown, entirely in white marble, with his arms outstretched. The conception and execution of the later metal bas-reliefs are elegant, but they are not in keeping with the statue. They illustrate the major works of this canonized Pope, such as the acceptance of Church doctrine by the learned men, against excessive modernity; the consecration of 15 French bishops, the reorganization of the Curia, the reconstitution of Canon Law and Gregorian Chant, to support the struggle against secularism; the founding of the Bible Institute and the reorganization of the Vatican Pinacoteca. The architect of this cenotaph, inaugurated in 1923, was Florestano Di Fausto; the sculptures are the work of Pier Enrico Astorri. As a spiritual leader, Pius X was notable for his encouragement of frequent communion, a practice that has transformed the lives of the faithful throughout the world. His agglutinate effigy stands in a niche of the left aisle. The pope, with outstretched arms and head bowed under the weight of an outsize tiara, is wrapped as it were in a blanket of white flour. He is shown in the act of supplicating the Almighty for the deliverance of mankind from the First World War, the declaration of which broke his compassionate heart. On either side of the cupboard door below him are bronze reliefs representing the grant of Holy Communion to children and the homage of intellectuals to the Faith.